Carved ivory plaque known as the "Romanos Ivory", thought by some scholars to be of the boy Emperor Romanus II and his child wife Bertha-Eudokia, the daughter of Hugh of Italy, c. 944-946. 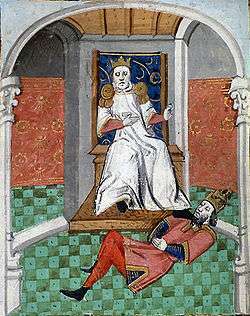 This piece is often used erroneously to show Emperor Romanus IV (Bibliothèque nationale de France). Romanos IV Diogenes (Greek: Ρωμανός Δʹ Διογένης, Rōmanós IV Diogénēs), also known as Romanus IV, was a member of the Byzantine military aristocracy who, after his marriage to the widowed empress Eudokia Makrembolitissa, was crowned Byzantine emperor and reigned from 1068 to 1071. During his reign he was determined to halt the decline of the Byzantine military and to stop Turkish incursions into the Byzantine Empire, but in 1071 he was captured and his army routed at the Battle of Manzikert. While still captive he was overthrown in a palace coup, and when released he was quickly defeated and detained by members of the Doukas family. In 1072, he was blinded and sent to a monastery, where he died of his wounds. Romanos Diogenes was the son of Constantine Diogenes (died 1032) and a member of a prominent and powerful Cappadocian family, connected by birth to most of the great aristocratic nobles in Asia Minor. His mother was a daughter of Basil Argyros, brother of the emperor Romanos III. Courageous and generous, but also impetuous, Romanos rose with distinction in the army due to his military talents, and he served on the Danubian frontier. However, he was eventually convicted of attempting to usurp the throne of the sons of Constantine X Doukas in 1067. While waiting to receive his sentence from the regent Eudokia Makrembolitissa, he was summoned into her presence and advised that she had pardoned him and that she had furthermore chosen him to be her husband and the guardian of her sons as emperor. She took this course of action primarily due to her concern that unless she managed to find a powerful husband, she could easily lose the regency to any unscrupulous noble, and also because she was infatuated with the popular Romanos. Her decision was met with little protest as the Seljuk Turks had overrun much of Cappadocia and had even taken the important city of Caesarea, meaning that the army needed to be placed under the command of an able and energetic general. The problem Romanos and Eudokia had in executing this plan was that Eudokia's deceased husband, Constantine X, had made her swear an oath never to remarry. She approached the Patriarch John Xiphilinos and convinced him both to hand over the written oath she had signed to this effect, and to have him pronounce that he was in favour of a second marriage for the good of the state. The Senate agreed, and on January 1, 1068 Romanos married the empress and was crowned Emperor of the Romans. Romanos IV was now the senior emperor and guardian of his stepsons and junior co-emperors, Michael VII, Konstantios Doukas, and Andronikos Doukas. However, his elevation had antagonised not only the Doukas family, in particular the Caesar, John Doukas who led the opposition of the palace officials to Romanos' authority, but also the Varangian Guard, who openly expressed their discontent at the marriage of Eudokia. Romanos therefore decided that he could only exercise his authority by placing himself at the head of the army in the field, thereby focusing the whole government's attention on the war against the Turks. By 1067, the Turks had been making incursions at will into Mesopotamia, Melitene, Syria, Cilicia, and Cappadocia, culminating with the sack of Caesarea and the plundering of the Church of St Basil. That winter they camped on the frontiers of the empire and waited for the next year's campaigning season. Romanos was confident of Byzantine superiority on the field of battle, looking on the Turks as little more than hordes of robbers who would melt away at the first encounter. He did not take into account the degraded state of the Byzantine forces, which had suffered years of neglect from his predecessors, in particular Constantine X. His forces, mostly composed of Sclavonian, Armenian, Bulgarian, and Frankish mercenaries, were ill-disciplined, disorganised, and uncoordinated, and he was not prepared to spend time in upgrading the arms, armour, or tactics of the once-feared Byzantine army. It was soon evident that while Romanos possessed military talent, his impetuosity was a serious flaw. Copper follis of Romanos IV. The obverse shows Christ Pantokrator, while the reverse depicts a cross quartered with the letters CΒΡΔ for the motto Σταυρὲ σου βοήθει Ρωμανόν δεσπότην ("Thy Cross aid the Lord Romanos"). Andronikos stipulated that his life would be spared if he resigned the purple and retired into a monastery. Romanos agreed, and this agreement was ratified at Constantinople. However, John Doukas reneged on the agreement and sent men to have Romanos cruelly blinded on 29 June 1072, before sending him into exile to Prote in the Sea of Marmara. Without medical assistance, his wound became infected, and he soon endured a painfully lingering death. The final insult was given a few days before his death, when Romanos received a letter from Michael Psellos, congratulating him on the loss of his eyes. He finally died, praying for the forgiveness of his sins, and his wife Eudokia was permitted to honor his remains with a magnificent funeral. Nikephoros Diogenes – born in 1070. ↑ Cheynet & Vannier 2003, p. 78. ↑ Dumbarton Oaks 1973, p. 785. ↑ Comnena, Book 9, Chapter 6. Wikimedia Commons has media related to Romanus IV.